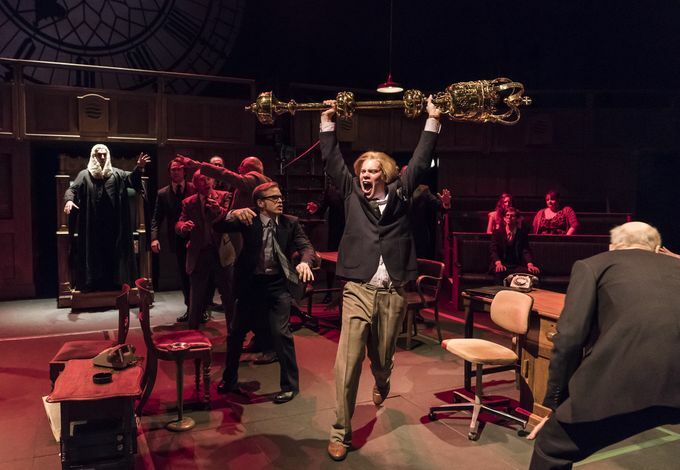 James Graham’s political masterpiece ‘This House’ is showing at Sheffield Theatres’ Lyceum until Saturday 2 June and is arguably one of the best live performances to tour the UK this year. Fast-paced and unafraid of exposing the disorder unseen by the public, ‘This House’ portrays the key players in 1970s politics with human fragility. Exposing the somewhat unabashed tact used by all parties (including the ‘odds and sods’), we see a government rife with uncertainty and conflict of interest. Perhaps the play engages so well with audiences due to its startingly familiar similarity with modern British politics. You’re left feeling like you’re living in a parallel universe as you recognise that not a whole lot has progressed in politics since; our future within Europe and the role of women in politics are but a few of the things that are no stranger to modern-day discussion. Petty complaints and playground frivolities are left, right and centre. Not only do we see the comical side of the House of Commons, but the more human faces of British politics. Party loyalties aside, ‘This House’ strips away the rivalry, leaving genuine cross-party friendships, formed over shared experiences of the chaos that is politics in 1970s England. And this is pleasantly surprising. Don’t let the political nature of this play put you off from seeing ‘This House’ – regardless of your familiarity with the modern history of British politics, this play, which has been produced by the National Theatre and Chichester Festival Theatre, serves up a perfect concoction of satire and poignancy towards the historical workings of government, and displays in easily digestible chunks, the human indecision that lies at the heart of it all. Don’t miss ‘This House’ while it plays at the Lyceum until 2 June. Click here to book your tickets, or call 0114 249 6000. Why not make the most of #SheffAfter5 and get busy in the city centre beforehand?